The Argus C33 of 1959 - 1961 was designed to be a system camera, with a set of interchangeable lenses and removable semi-coupled exposure meter. It was not a big success commercially, partly because of its clunky configuration and comparison with contemporary cameras from Germany and Japan. This particular example came to me in very sad shape. The two chromed side panels were missing from the body. Internal elements of the viewfinder had fallen out of position. The back latch button had sheared off and was missing. The mounting base of the CM2 meter was broken. And the shutter speed escapement was essentially non operational. I took it as a challenge to work on it until it was capable of exposing a set of images. Thorough cleaning and workable replacements for some of the missing parts were a good first step. However, flushing the shutter mechanism with solvent did nothing to restore the shutter speeds. Best I could do was electronically test what speeds there were and record them with a chart. Notice that the usable speed range makes little logical sense. The CM2 meter was still accurate and usable as a hand held device. And after a little cleaning, the 50mm lens that came with the camera seemed very good. I loaded the chamber with some Fuji 200 and and took the camera and meter outside for testing. First portion of roll was exposed here at home in yard and gardens. 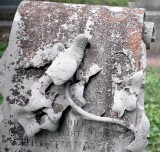 The remaining portion was finished off at St. Martin's, the oldest cemetery I know of in High Ridge. The film was difficult to load, with the design of the C33 takeup drum. The film transport behaved poorly, with inconsistent spacing of frames, and partial overlap of several exposures onto the filmstrip. However, the lens performed quite well, I thought. And the camera body felt surprisingly "right" in the hands, despite the boxy shape. You did an excellent job of fixing it!!! Love the fairy and gnome village! What an old cemetery. It's like the Burtner cemetery. Love the non-linear shutter speeds. Congratulations on sparing another Argus a trip to the recycle bin. Nice crisp images. Your yard and garden look beautiful. Nice colors and pics.